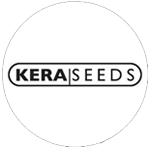 Kera Seeds is a dutch seedbank that has over 12 years of experience in the coffeeshop branch. This is how they know which types of cannabis are popular in Dutch coffee shops. You can find all the popular dutch seeds in the KERA CLASSIC coffeeshop selection. To improve their quality and assortment, they\'re also collaborating with famous seedbanks in the USA. At Venice Beach (Los Angeles, California) for example, you’ll find remarkable types of cannabis. They crossed for example the White Widow with a couple of unique American types of cannabis like the Trainwreck, OG Kush and Blue Berry. You’ll find these one of a kind crosses in the KERA CALIFORNIA selection.